Thanks to Rescue 911 and other emergency reality shows on TV, helicopters are one of those things that people anticipate coming to their call for help. And in a lot of cases they are the best tool to solve many of the problems. They can move quickly, and they can reduce the hazardous exposure to the rescuers. Flying in a helicopter may seem dangerous, but sometimes it’s more dangerous putting a boat in the water than it is putting a helicopter in the sky. If you’ve got a boat and you’re doing a rescue and right below you is Killer Fang Falls, there’s a chance that everybody is going to go over those falls if the motor quits. It can be a whole lot safer doing everything from the sky. With search and rescue, we have three different avenues of approach. We can approach from the ground, the water, or the air. Invariably, something is going to happen that makes it impossible for us to approach from the ground or the water. Flooding, for example, can make the ground approach difficult or impossible. Obstructions in the water can cause life threatening and unsafe conditions for boat squads attempting a rescue. That’s when air rescue is a very complementary modality – a perfect tool in the response toolbox. 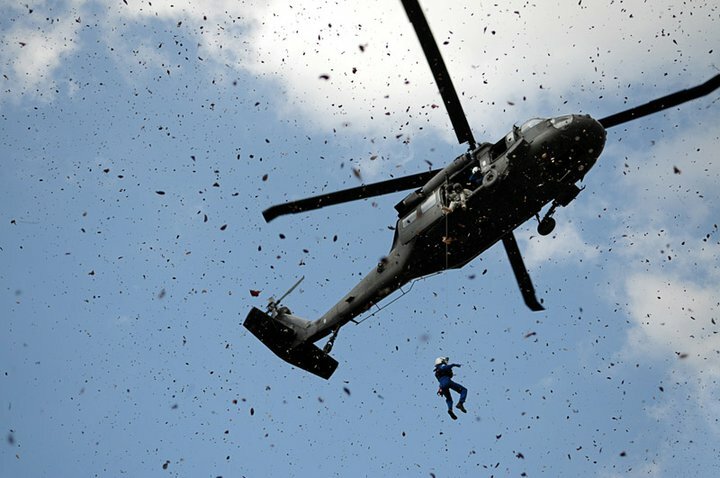 One of our mottos is “Do the most good for the most people in the least amount of the time.” The tool that works is the best one – it may be as complex as sending in an entire task force or it may be as simple as sending in one Blackhawk helicopter to retrieve someone trapped on the roof of their vehicle, on the top of their house, or out of a tree. 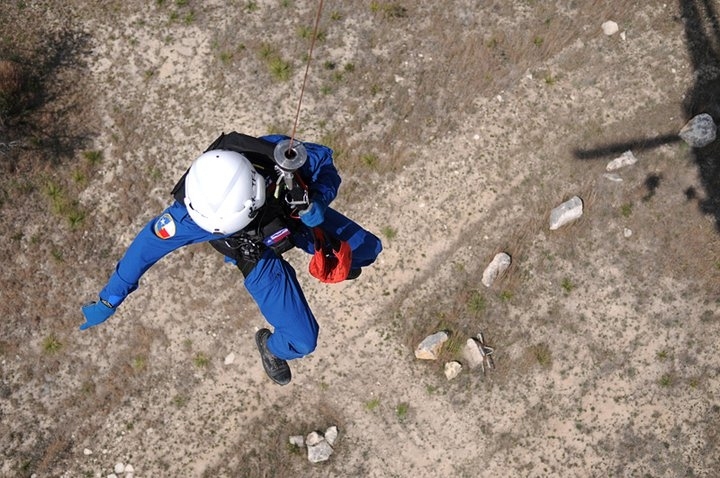 The Texas Helicopter Search and Rescue Team (HSART) program was started in 2001 after Tropical Storm Allison. 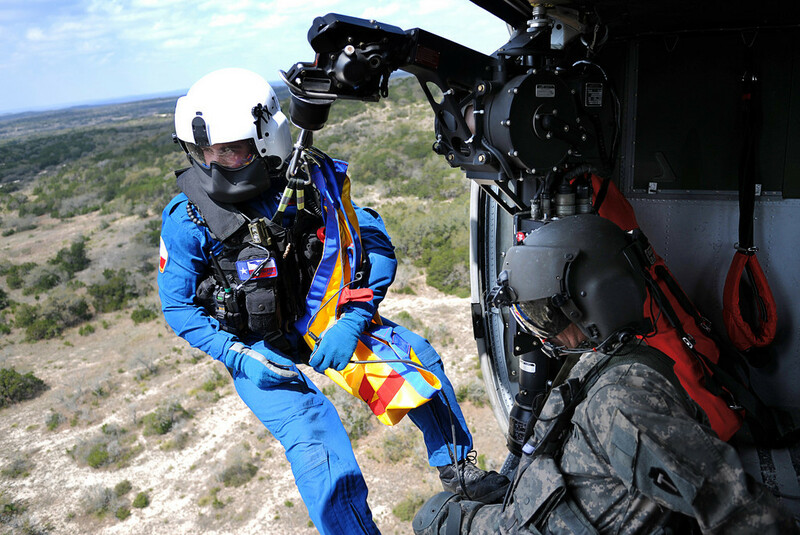 Initially, it was a joint partnership between STAR Flight, an EMS/Rescue helicopter program; Texas Military Forces (TxMF), a part of the Texas National Guard; and TEEX and its Texas Task Force 1. The program now has standard operating guidelines, standard equipment and standard load configurations. Every person that goes on the hook goes on the hook the exact same way; every person that sits in the helicopter sits on the exact same spot. That coordination, that crew management piece is really being honed, and that’s one of the advantages of having the monthly trainings we hold. 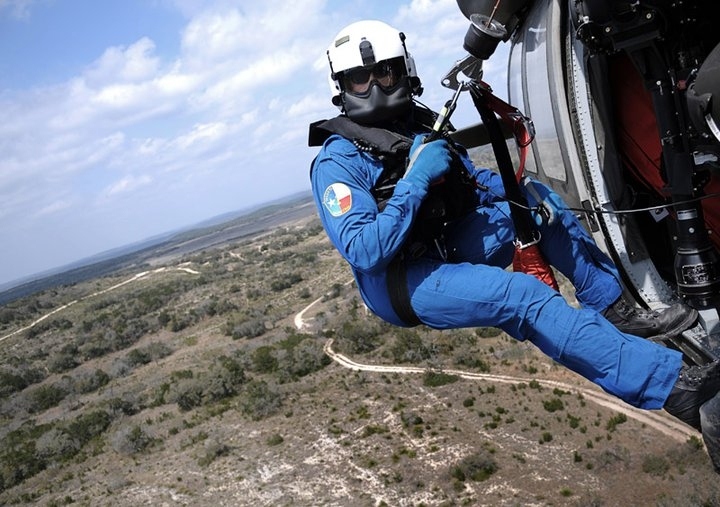 We’ve got 15 members of the Texas Task Force 1 now who are dedicated to helicopter rescue. We bought each one of the rescuers all of the gear that they needed so that they’re outfitted exactly like the pilots and crew chiefs: same exact helmets, same exact flight suits, same exact equipment. We also provided them with the additional personal protective equipment to do all of the lifesaving missions. That’s above and beyond what the flight crew and pilots are taking with them on the helicopter. And we bought all of the appliances to provide the lifesaving equipment—the helicopter litter, the rescue baskets, etc. That just seemed like the right thing to do-- that’s part of the partnership. And it gives all of our rescuers ownership because it’s their safety that depends on that equipment working, so they will take better care of it if it’s their stuff. We’re just starting to work on TxMF’s new helicopter airframe, which is called a Lakota (LUH72), in addition to the Blackhawk helicopter. While it doesn’t have the same capacity as the Blackhawk, the Lakotas can still be used for search and rescue, rapid needs assessments and for surveys, as well as doing a 911 response single dispatch to an area. If the situation is bigger than they can solve, if they need more resources, then they would probably call in one of the Blackhawk crews to assist in dealing with it. Plus, the Lakota is the same helicopter as the EC145, which is what the Texas Department of Public Safety (DPS) and STAR Flight have. So these three organizations will have the same asset. That gives us interoperability, which is always a good thing. The cross-training pieces of it will apply, and lessons learned working with one organization transfer to the other organization, and that’s what we’re hoping for. The Texas HSART is important for our citizens because sometimes air rescue is the only tool that will work. Sometimes without that tool, the problem is unsolvable. There is nothing in the policy and procedures that allows for a national guardsman to be a rescuer, and there’s nothing in the Texas Task Force 1’s guidelines that allows any of our people to fly helicopters. So by providing Task Force rescuers to the TxMF helicopters, we provide the complementary piece that gives the state and the TxMF the full benefit of that aviation asset. It’s a perfect partnership that saves lives. Jeff Saunders is TEEX's Associate Director of Disaster Preparedness & Response as well as Texas Task Force 1 (TX-TF1) Operations Chief.